ATROCITY, one of the most successful metal bands from Germany, was formed in 1985 and is known as one of the most experimental and varied bands in the history of metal and as the pioneers of German death metal! They are not shy when it comes to venturing into uncharted terrain, while always delivering top-class productions. A good example is their album “Werk 80 II”, which entered the German Media Control Charts on #19. ATROCITY already played on 5 continents, over 50 countries and played hundreds of gigs. “OKKULT” (2013) marked the beginning of a very special album trilogy, that the metal scene has not seen until then! 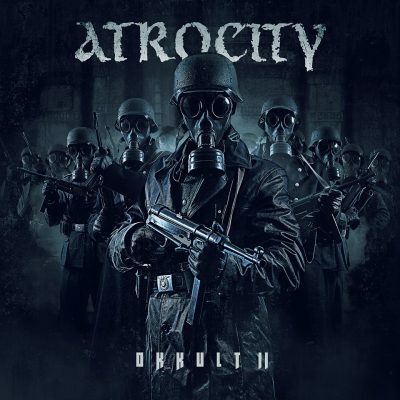 Following their “OKKULT” world tour, ATROCITY once again signed with Massacre Records and released the “Masters of Darkness” EP (2017) as a harbinger of the death metal flagship’s album “OKKULT II” (2018). “OKKULT II” is a dark, brutal and bombastic masterpiece! This killer album is packed with vicious death metal gems! Fans of heavier ATROCITY albums, like “OKKULT” or their death metal classics like “Hallucinations”,”Todessehnsucht”, “Blut” and “Atlantis” will get all they hope for and more! “OKKULT II” once again showcases the tremendous spectrum of what ATROCITY are capable of; delivering a crisp, powerful and atmospheric production, with expansive horror movie choirs and brutal metal songs, that will dig deep under your skin! Boasting a huge production – courtesy of producer and ATROCITY main man Alex Krull (Mastersound Studio) – Krull has made sure that the songs are as unrelentingly heavy as possible, while ensuring that the atmosphere and energy of the songs draw the listener immediately into the occult lyrical concept, dealing with occult magic, strange places and events, conspiracy theories and still unsolved mysteries. The band once again recruited the award-winning Canadian sound designer Katie Halliday (who has worked on movies such as “SAW V”, “SAW VI” or “SAW 3D (VII)”) whose chilling approach to the album made sure that the atmosphere of the record took the music to even darker corners! 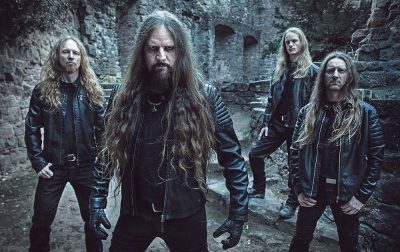 The addition of two death metal icons, LG Petrov (Entombed A.D.) and Marc Grewe (ex-Morgoth), has given ATROCITY fans another layer of excitement as they wait to hear what the vocal legends bring to the already devasting ATROCITY sound! Featuring stunning artwork from Stefan Heilemann (Lindemann, Pain, Kamelot, Epica, etc.) ATROCITY add to the intensity with a deliberately thought-provoking cover! 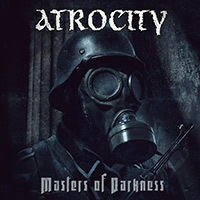 ATROCITY have a proven track record in writing death metal classics, and new cuts like “Shadowtaker”, the death metal masterpiece “Spell Of Blood” are brutal anthems while “Masters Of Darkness”, “Bloodshed And Triumph” or “Infernal Sabbath” are pitch-black extreme metal hymns, to warm even the blackest of hearts! “OKKULT II” is THE death metal album of the year! Musically, no prisoners will be taken! The impressive “Masters Of Darkness” EP is the perfect harbinger of the album “Okkult II”! The German metal flagship is back with a vengeance! In 1985, ATROCITY was formed. After the releases of the demo tape “Instigators” (1988) and the EP “Blue Blood” (1989) on Nuclear Blast (this EP is a rare collector’s item nowadays), ATROCITY presents their debut album ‘Hallucinations’ which was produced by Scott Burns at Morrisound Studio, Tampa/FL in 1990, a forerunner of technically skilled Death Metal. The cover artwork was done by HR Giger. After international tour successes, ATROCITY releases ‘Todessehnsucht’ in 1992 via Roadrunner Records. They surprise the critics with classical elements and opera singers as guest musicians, to integrate them into their music. This bombastic sound brings ATROCITY in comparison with ‘Wagnerian moments’ and they manifest their reputation as a ‘band with extremely complex and well structured song ideas’. In 1994 ‘Blut’ is released through Massacre Records. The Vampire concept is the red line in the entire album, and it enables the listener to feel the dark scenery and fascinating atmosphere of Transylvania. The creative output causes a very positive reaction from the press and fanbase: ATROCITY cannot be put into any stylistic category any more. The videoclip “Blut” was filmed on a Transilvanian castle. Both CDs from 1995, ‘Calling the Rain’ and ‘Die Liebe’ are logical consequences of this. The song ‘Calling the rain’ from the ‘Blut’ album was so positively well received that ATROCITY decided to continue in this way. With the vocal support from Yasmin Krull, the band reaches a new atmospheric level. ‘Die Liebe’ is a groundbreaking teamwork from ATROCITY with the German Gothic Icon ‘Das Ich’. Both bands arranged songs of the other band to finally interpret them together. It is the first time that two bands from the Metal and the Gothic scene are working together which laid an important foundation stone for the Metal and Gothic crossover. ATROCITY finally managed to become a solid term for fans of Dark Wave and Electro music. 1996: ATROCITY’s album ‘Willenskraft’ gets the past, present and future right to the point with an arrangement of brutal riffing, hymnlike parts and atmospheric elements. ‘The definition of Kraft & Wille’ EP with its Electro and industriallike remixes is a bonus as well as a sequel to the cooperation with Das Ich and it also contains their classic ‘Gottes Tod’. As a complete contrary program you get the ‘The Hunt’ EP with brutal songs (including a remake of ‘Blue Blood’) which expressed the band’s gratitude to the Old School Friends for their long years of support. The limited video box ‘Kraft & Wille’ was another present to the loyal fans. In 1997, ATROCITY decided once again to enter new musical grounds. The intention of ‘Werk 80’ was to transform pop-classics of the eighties into ATROCITY songs. The outcome was a wave of rapturousness in the clubs: with songs like ‘Wild Boys’, ‘Shout’ or ‘Der Mussolini’, the fans managed to dance them into the charts. Before the end of the Millennium, ATROCITY released their first greatest hits album ‘Non Plus Ultra’ (1989-1999) with a lot of specials and the premiere of their first live show in the USA. The following and successful chart album ‘Gemini’ (2000 on Motor/Universal) continued where Werk 80 has ended up. Electronic elements, a bilingual textual concept and even more essential structures, without loosing the typical ATROCITY – Originality. After that, ATROCITY signed a worldwide record deal with Napalm Records and in 2004, the spectacular ‘Atlantis’ album was released. According to their tradition, the quintet preferred an entire concept album. ‘Atlantis’ is a very diversified and atmospheric Metal album, which contains bombastic, epic songs in which heaviness, atmosphere and melody work hand in hand to tell the story of Atlantis and the Golden Age. Besides engrossing the listener not only in a musical way, you find on ‘Atlantis’ a multimedia section with detailed information about the greatest myth of our time. In 2008, ATROCITY brought back the 80s once again, heavier than ever before, by delivering thrilling arrangements of well-known songs such as “Smalltown Boy”, “The Sun Always Shines Of TV”, “Fade To Grey”, “People Are People”, or “Don’t You Forget About Me”. The cover model of the Top 20 chart album “Werk 80 II” is nobody else than fetish icon, Pin Up Star and world famous Burlesque artist Dita von Teese! Moreover, the hits from WERK 80 II were put in action with the help of a symphonic orchestra and a choir in the typically bombastic ATROCITY style. Ethno meets Metal: In 2010, the metal chameleons forged another alliance with vocalist Yasmin (the sister of frontman and producer Alexander Krull). ATROCITY FEAT. YASMIN album, “After the Storm”, does not simply reiterate the sounds of the past, but rather elevates the songwriting and production to an entire new level. All instruments were performed live and the ample amount of percussion allows for a tapestry of complementary rhythms. No listener will remain untouched. The music of ATROCITY FEAT. YASMIN can only be described with one word: unique! In 2012 it was time for ATROCITY to release a retrospect of their long spanning 25 year career. The highlight of this splendid Double DVD, which also includes an audio CD, is the three-hour-long anthology film “Die Gottlosen Jahre”, completed over a period of many years. More than 80 interviewees from the world of metal and gothic stepped up to the plate: Band members of CARCASS, ARCH ENEMY, KREATOR, DIMMU BORGIR, DEICIDE, OBITUARY, SODOM, LACRIMOSA, DAS ICH, OOMPH!, PAIN, CREMATORY, ENTOMBED, MORGOTH, NAPALM DEATH, PUNGENT STENCH, UMBRA ET IMAGO, SAMSAS TRAUM, GOETHES ERBEN, journalists (METAL HAMMER, ROCK HARD, SONIC SEDUCER, ZILLO etc. ), labels (ROADRUNNER, NUCLEAR BLAST, NAPALM RECORDS), as well as deejays, photographers, and fans! Also included was he 25th anniversary special show (performed at WACKEN OPEN AIR 2010 to a red-hot crowd led by frontman Alex Krull) or without an abundance of bonus material such as the documentary “No Sleep ‘Til Wacken”, the short “DREATH Sidestory ‘Underground'” featuring Alex Krull and Ralf Scheepers (PRIMAL FEAR), as well as a substantial collection of the band’s video clips. In 2013 the ATROCITY opus “OKKULT” was releaed. The kickstart to an album trilogy, as it has not been seen before in the metal scene! Musically ATROCITY show an enormous tension width, and deliver a very powerful, homogeneous and atmospheric album. The lyrics relate to occult magic, mysterious places, conspiracy theories and mysteries that are still unsolved. In keeping with the dark atmosphere of “OKKULT” the band got the Canadian Sound Designer Katie Halliday on board. She worked for movies like “Saw V”, “Saw VI”, “Saw 3D (VII)” or “The Devil’s Carnival” and already could reap some awards for her work. Besides all harshness and bombast ATROCITY again show their excellent sense of very good, catchy songs. ATROCITY played all over Europe North America, Latin America and Asia on the “OKKULT” World Tour.